Best-known as the other books written by The Hitchhiker's Guide's Douglas Adams, Dirk Gently's Holistic Detective Agency and its sequel The Long Dark Tea-Time of the Soul have been optioned for an American comic book series and a TV adaptation. IDW and Ideate Media have nabbed the rights, and IDW has hired Chronicle's Max Landis to write the TV pilot and executive produce. Before you start getting upset about the series transposing the British characters to an American setting, please remember there are no details about the show yet, and likewise there's no telling if any channel will even decide to pick up the pilot. There will be plenty of time for panicking later, once we have actual details to panic about. For now, just grab your towels and hope for the best. "Alongside the obvious yada yada, I'm a lifelong fan, Long Dark Teatime of The Soul (the second Dirk Gently novel) is one of the best books ever," Landis said. "Douglas Adams is a visionary who forever changed the way science fiction is written and talked about and even thought about and even the way real actual science is thought about and without whom our culture would be noticeably different for the worse. 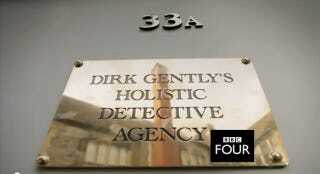 I'd also just like to say holy crap, it's Dirk Gently." He continued: "This is any writer's ultimate project, and in the current TV space, it fits ridiculously well. Imagine a playground where you could come with any mystery, no matter how improbable, convoluted or totally insane and then, simply by finding the right connections, you could tie it all down to one man, one private eye. If you're familiar with the property, you know: there's no freaking rules. Ancient gods? Sure. Larceny and petty crimes? Of course. Extra-dimensional aliens? I mean, probably; as long as you can make it funny, Dirk's on the case. This is a dream project of mine, no joke, and I absolutely positively couldn't be happier." Obviously, this will have nothing to do with the BBC's recent Dirk Gently TV adaptation. Just in case you were wondering.